Flight Day 2 is winding down for the astronauts. They'll be heading into an 8-hour sleep period at 10:53 p.m. EST. Tomorrow is docking day! Discovery's reaction control jets have been fired for NC3, which is the latest course correction maneuver on the path to reach the space station. The crew has extended the docking ring that will connect the shuttle's port to the space station, setting up the springs and shock absorbers to do their roles during the link. The astronauts also set up the centerline camera in the docking port to be used in the final approach. The Orbiter Boom Sensor System has been locked down in the payload bay, its job of inspecting Discovery's heat shield complete for today. The boom will be used again late in the mission for another round of observations to check for space debris impacts before Discovery comes home. A few highlights remaining on the to-do list for this workday include installation of the centerline camera in the Orbiter Docking System to help commander Steve Lindsey during tomorrow's approach to the space station, a checkout of the rendezvous tools and the docking ring will be extended in preparation for linkup with the station's Harmony module. The crew is scheduled for sleep at 10:53 p.m. EST. The mission's spacewalkers have worked down on the middeck today testing and readying the spacesuits that will be worn during upcoming excursions outside the International Space Station. The port wing sweeps by the inspection boom have been completed by the crew, finishing today's heat shield surveys. It will take a day or two for ground analysts to review the data and declare the heat shield safe for re-entry. The astronauts will return the 50-foot-long structure back into its cradle in the payload bay a short time from now. Even more launch photos from Discovery's blastoff! Shuttle Discovery is about 6,600 miles behind the International Space Station and closing for tomorrow's docking at 2:19 p.m. EST. The next orbit adjustment maneuver by the shuttle is coming up tonight. The ship is performing flawlessly with no technical issues being worked by the flight control team. The Mission Management Team has examined the external tank imagery collected by shuttle cameras during separation yesterday. They show a chunk of missing foam on the ribbed intertank section near the bipod struts. But the insulation broke away nearly four minutes into flight, which is well beyond the sensitive timeframe when there's enough air for debris to cause damage. So no concerns for Discovery with that foam event. The preliminary cause for the foam loss is the "cryopumping" condition. It is located at the top of the hydrogen reservoir within the tank, and by four minutes into flight that portion of the tank has been emptied and warmed up. A shift change has been completed in Mission Control, as the Orbit 1 lead team of controllers overseen by flight director Bryan Lunney have handed to Orbit 2 with Ginger Kerrick. Post-launch checks of the reinforced carbon-carbon panels on the leading edge of Discovery's port wing are getting underway. The crew has finished the nose cap survey. The left wing inspections are next up in this multi-hour job to survey the shuttle to look for any signs of launch damage. The precautionary safety inspection has become a standard activity for all post-Columbia shuttle crews. Check out this stunning collection of launch photos from yesterday! The astronauts have swung the inspection boom into position out in front of Discovery to get a closeup look on the shuttle's nose cap. Inspections of space shuttle Discovery's starboard wing have finished. The extensive imagery and laser data will be analyzed by specialists on the ground to determine if the spacecraft's heat shield is safe for re-entry. Nose cap inspections are next. Astronaut Timothy Kopra, who was replaced on the shuttle Discovery's crew after being injured in a bicycle accident last month, called his former crewmates Friday to say hello and pass along best wishes for a successful mission. Sweeping back and forth, back and forth, the inspection device is looking for any signs of damage to to the leading edge of Discovery's starboard wing that could have occurred during ascent yesterday. The injured Tim Kopra, originally part of Discovery's crew as the flight engineer and lead spacewalker, just called the shuttle astronauts from Mission Control and wished them well. Kopra was hurt in a bicycling accident last month and was replaced on the crew by Steve Bowen. 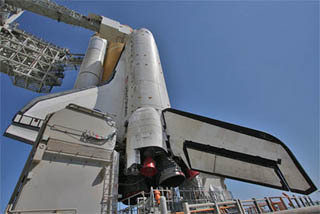 The Orbiter Boom Sensor System, anchored on the end of shuttle Discovery's robot arm, has been positioned to begin today's heat shield inspections. Scans on the starboard side of the shuttle will be performed first. The crew completed the calibration and testing of the sensors. They also took imagery of the starboard plate where the launch pad umbilicals connect to the shuttle. The boom has been released from its cradle and raised out of the shuttle bay. The astronauts will work to activate the camera and laser sensor package on the boom to scan the wings and nose of the orbiter over the next several hours. Shuttle Discovery's robotic arm has grappled the Orbiter Boom Sensor System and the restraints holding that 50-foot-long inspection device in the payload bay are releasing it for unberthing. After waking up, having some breakfast and going through their morning routine, the Discovery astronauts have gotten to work. They just completed the latest engine firing as part of the two-day rendezvous sequence to catch the space station. The NC2 burn was executed using the right-hand Orbital Maneuvering System engine, changing the shuttle's speed by 10.3 feet per second. Coming up shortly will be the grappling of the inspection boom by the shuttle's robot arm. The Discovery astronauts are spending their first full day in space inspecting the shuttle's nose cap and wing leading edge panels for standard post-launch heat shield checks, testing equipment needed for upcoming spacewalks and preparing for tomorrow's docking to the International Space Station. Mission Control has awakened the astronauts to begin Flight Day 2, the crew's first full day in orbit. Today will be spent inspecting Discovery's heat shield for any signs of launch damage, a routine task for shuttle crews. Other activities include checking out the spacesuits to be worn during the mission's spacewalks and preparing equipment for tomorrow's docking to the space station.